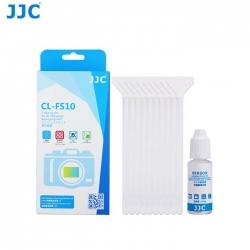 JJC CL-FS10 Full Frame Sensor Cleaner Kit is specifically designed for cleaning full frame CCD, CMOS. 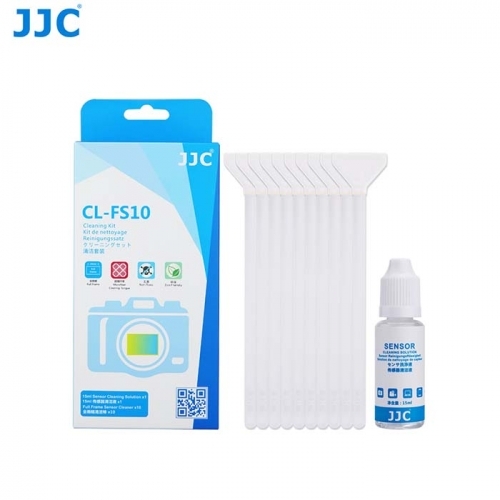 JJC CL-FS10 contains 10 full frame sensor cleaners and a bottle of 15ml cleaning solution. The sensor cleaner is sealed in vacuumed package for 100% dust free. The cleaning tongue adopts V shape design which can effectively reduce the contact with the sensor. Made of high quality microfiber, the cleaning tongue features a high dust-attracting power. Made of high quality microfiber, the cleaning tongue features a high dust-attracting power and leaves no lint after cleaning. Besides, the width of cleaning tongue is exactly the width of full frame sensor. Non-toxic and environment friendly, the cleaning solution is safe and effective to clean away dust and oil stains. Besides, JJC CL-FS10 is useful for cleaning lenses, LCD screens and other delicate devices’ surfaces.